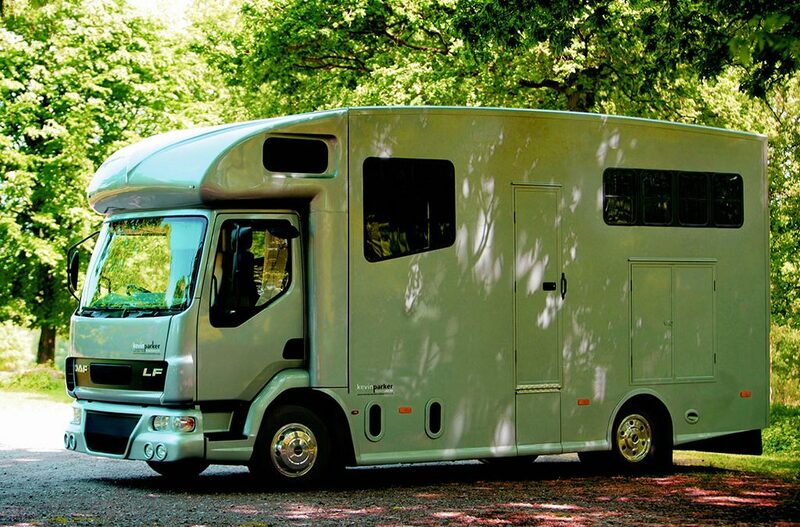 Before you buy a Horsebox – consider these points. Deciding to buy a horsebox is a relatively simple task. But, actually finding something to fit your individual requirements, that is lightweight, tough and capable of legally transporting your horses safely is more problematic. It is in fact a minefield with designs, quality and safety features varying wildly across the board. I thought it would be worthwhile highlighting some items worth considering that may not at first be obvious. Cost to purchase and run will be a major consideration, as will the number of horses, sleeping, cooking and toilet facilities. Much like buying a car it is relatively easy to be swayed by the simplest of things. As an example, shiny paintwork is the first thing customers see and can often influence a decision to buy. In reality, although paintwork is important, the focus should be on the bones of the horsebox first and colours and fittings should be secondary. It is always sensible to start with an HPI check. Next, above all other considerations I would jump straight to payload. Payload is the amount of horses, people, tack, water and fuel you can legally carry. To calculate the payload, you need to know the Maximum Authorised Mass (MAM), often referred to as the Gross Weight, or GWT of the horsebox and subtract the un-laden weight (how much it weighs empty from its weighbridge certificate) from the MAM. This calculation gives the payload. As a very quick example, the MAM of our Aeos Hybrid is 4.5 tonnes and the un-laden weight is 2.7 tonnes. So the calculation for permissible payload is 4.5 (MAM) subtract 2.7 tonnes (un-laden weight) and this gives 1.8 tonnes payload. The marketplace is flooded with overweight horseboxes. Overloading a horsebox affects cornering, suspension, brakes, and voids insurance. They represent a significant threat to horses, passengers and other road users. Fortunately with a more informed public, both new and used horseboxes that are overweight have become considerably harder to sell. I would add a word of caution here as a healthy payload can be achieved in two ways. The more expensive route is manufacturing using the latest materials and designs, in a manner that actually makes the horsebox stronger as well as lighter. The other route is to keep the overall price down and cut corners wherever possible, this often includes removing safety features and results in a build that only needs to outlast the first year’s warranty period. My advice would be to approach any sales meeting armed with the payload you require and to be on the safe side, remember to leave a little spare capacity. The sensible route here is to avoid horseboxes without a current weighbridge certificate and bear in mind it is not uncommon for people to remove partitions and horse doors when weighing overweight horseboxes to sell ……and yes it does happen, I have seen it! To be completely transparent KPH weigh vehicles onsite and everything we manufacture has a weighbridge certificate. We even offer our customers the option to weigh horses. This is a difficult one for customers because they do not look with the eyes or experience of a coachbuilder. At the very least customers should have a good look underneath for finish and attention to the details and how is it protected from water and salt. I make a point of showing customers underneath our horseboxes and our finish here is just as good as the outside paintwork. Do not believe the hype that aluminium or galvanised steel does not rot. We paint it and then spray it with Waxoyl regardless of whether it is aluminium, galvanised steel or stainless steel. If you buy a used horsebox, whilst inspecting underneath I would check the horse floor and supporting subframe. Steel and aluminium both corrode so look for broken welds or cracks. If it has an aluminium plank floor and aluminium subframe I advise a close check around bolts and screws for fracturing as this is a common fault. An inspection should include tyres, steering, clutch and brakes. A visual inspection of the tyres should highlight tread depth and individual tyre condition and don’t forget to check for cracking on the tyre walls. A short test drive should highlight steering, clutch and brake issues. I would also look for oil and water leaks and if it has air brakes, it’s a good idea drain the system down by pumping the foot brake when the engine is off until the low air alarm sounds, then start the engine and let it fill up again until the buzzer goes quiet. At this stage it’s probably worth testing all the gauges, fans and lights etc. In addition, service histories are of benefit when available, however many used horsebox chassis have been maintained fleet vehicles so service history is notoriously hard to come by. Horse safety should be part of any inspection and must be high on any list. Horse partition strength is important as are edges on cappings and any metalwork. Ramp condition, angle and fastening mechanism should be checked and take special care looking at the hinges, it’s where most horseboxes have major problems later in life and these are expensive to fix. If you buy a horsebox that is used test the weight of the ramp and if you can close it, often used horseboxes will need new springs to make them easy to close. New springs are a fairly easy fix and sometimes just altering poorly set up hinge points is all that is needed. Living areas can vary greatly from horsebox to horsebox, but the main items to check are the water system, 12/24 volt and 230 volt systems and all gas appliances. A current Gas Safe certificate should be included and this should be renewed yearly. As a side note a carbon monoxide and smoke detector should be fitted for safety to any living area. It is also worth considering the pros and cons of buying from a dealer or buying privately. Buying privately may be the cheapest option but is almost always sold as seen, whereas buying from a dealer often has some warranty and will come under the Sales of Goods Act 1979. Finally I would add if you are going to buy a horsebox and have any doubts or question please drop me an email from our Contact Us page and I will be happy to help.